Curiously, just across the road outside St Paul’s Cathedral is another one. I wonder what the bogans who often hang around there will think of it. I hope the bikes are tough. The other initial locations are mostly around Swanston Street, with a couple up near Melbourne Uni, and one at Southbank. Apparently it will eventually spread to some fifty locations. I’m maintaining my previous cynical view of it. I’m happy to be proven wrong, but I just don’t see who would use it. If you’re a Melbourne local who arrived in the city by PT, your trip around the CBD by tram or bus or train is included in the price of your ticket, and is probably more convenient by PT than bike. Why would you pay more, and carry a helmet to do it by bike? If you arrived in the city by car, I really doubt you’ll be carrying a helmet and hiring a bike. If you work close to the city in a spot not well-covered by PT (perhaps somewhere like Fishermen’s Bend), even if you did carry a helmet, unless your destination also has a bike share station, you’d pay a fortune to have the bike at work all day. You’re more likely to bring your own bike on the train. There is one possible group I can see: CBD residents, but only if they are of the mind to ride a hired bike (not one they own themselves; perhaps if they have limited space in their flat), bring their own helmet, and if they are making a trip that was genuinely easier by bike than other means. And it would have to be a trip to the vicinity of another bike share station — all highly unlikely with the initial stations, given they’re almost all parallel to Swanston Street, which has a tram every minute or so. The helmet thing — the government claims to have a solution: ”very cheap” helmets would be available to people who joined the bike scheme. He did not specify how much the helmets would cost. Helmets would also be available at city shops near the bike stations. But it’s not yet clear what this means: how much is “very cheap” and if that means shared helmets or buying a cheap one if you’ve forgotten to bring your own. I may be proven wrong, but get the feeling the bike share scheme may turn out to be a big waste of (taxpayers’) money. It’s part of the plan. Update lunchtime: The Age: On your bike: public hire scheme hits CBD — Melbourne is the only city in the world with compulsory helmet laws to have launched a bike share scheme. Absolutely agree with you Daniel, with the helmet requirement this scheme will be dead before it gets out the door. I predict within 6 months following the election the bike stations will all quietly disappear. A shame because the scheme works really well in Paris and other cities overseas – but as long as the nanny state insists on wearing bike helmets, it’s just useless in Australia. I can’t see it working either, I didn’t even think of the helmet thing. These bike will be trashed, stolen and ripped apart in no time. yeah, very cynical, like you. Helmets can be bought for less than 20 bucks at BigW. The cost is not the issue Roger. Carrying it around with you all day, ready for your 20 minute bike ride, that’s the problem. On Twitter: @funkineering says “architects or engineers who have client meetings in cbd? work places could provide helmets…” — that may be a good point, as companies can set up shared accounts. Again, it would need to be a trip easier on a bike than on a tram etc, and a short enough appointment that they didn’t get stung for excessive fees. It sounds stupid to pay to park bikes. If you need to go to a meeting in the city and can’t park the bike at the bike share station within about 50 metres of the meeting venue, it’s pointless. You can’t lock these bikes up yourself can you? It is indeed part of the plan. And the plan, by the looks of things, is to encourage as many people as possible to use cars to get around. 1) Congested tram routes would be perfect for this. I’m thinking the southern cross to docklands route and also flinders to domain interchange would be perfect for this and it’s outrageous they were not included in initial trial! 2) I also would not dismiss park and ride. Parking on city fringe which have better rates and biking into town is attractive. 3) Many cbd offices have bike parking facilities although limited. Architects and engineers especially given they are at the forefront of esd and green building design. Let’s find pragmatic solutions to this scheme rather than pick holes through it. Is tieing your helmet to your backpack really that hard? Come on that’s a weak argument. Tourist spots have places to store your backpacks and work places are good drop off areas. Nobody is carrying their helmet all the time. The lack of bikes is just anticipating demand. Yeah these bikes are going to get trashed unfortunately. Additionally from the helmet thing, if people do use them to beat trams to stations, what happens when the station park area is full? The park stations don’t look too large so 30 odd trips ought to mean there’ll be a massive imbalance of bicycles at various park stations. The reverse could happen in the AM peak hour. You have pretty much covered all bases there Daniel. Who is going to use it ? If I lived in East Melbourne or Carlton or somewhere, I’d be using my own bike. If I came from the suburbs and needed to make an errand in the inner city, I’d take a tram. And if I was visiting Melbourne, its unlikely a bike would be attractive over a tram, unless it was a perfect day weatherwise, I was going to ride somewhere “nice” like the riverbank or a park, and I didn’t have to wear a helmet, neither of which usually apply. enno. A key assumption is that trams are an attractive alternative which is not always the case especially in peak hours. Also you are assuming most tourist are efficient human beings. Not really. Tourist enjoy a sense of discovery, and bikes can give a closer look for those who seek it. Fully agree with most of what’s been said here. Be very surprised if it lasts more than a year. But even funnier is the fact they started it as winter is approaching! I’m an inner-City resident who lives near Melbourne University and I think it is a brilliant idea, mainly because it provides an alternative to having to buy tickets and use trams. Grated the compulsory requirement of helmets greatly reduces the convenience of the scheme, but I suppose RACV’s hands are tied as there’s no way the Government will change the law just to accommodate this scheme. I agree with Funkineering that we should find pragmatic solutions instead of picking flaws with the scheme. I’m no design expert, but surely there will be ways to provide helmets with the bike rental. According to The Age there’s a small basket located at the front of the bike. They could (or could’ve) attach a helmet to each of the bikes and somehow “locks” when you return the bike and that will solve the helmet problem. Or if one is mindful that the helmet might get wet etc, make the basket into a small box and put the helmet inside the box. Proposed bike stations map from The Age. I reckon it’s a good idea, but it needs to be rolled out to more places besides the CBD. In the CBD, public transport pretty much covers nearly everything, and for the bus/tramless street’s, walking is of more value. However, outside the CBD, but of course, not too far, public transport doesn’t seem that great of an idea. Example: Today, I decided instead of catching the train from South Yarra (I’m about 500 metres north of the station) to Richmond (so I can change to the eastern lines), I’ll walk along Capital City Trail and up Punt Road. I beat the train by 1 minute. If I had a bike, it would’ve taken considerably less time. “myki money purchase” appears on this twice. It obviously isn’t a trip, because both myki money and pass are covered by the touch on/off’s (correct me if I’m wrong?). I’m assuming there is an intention to introduce myki as a transaction method, like the Octopus card in Hong Kong. Because before the myki website upgraded, there was a survey that asked what people want to use myki for – answers included newsagents, convenience store, pay for parking etc. I agree with you. Helmets are the problem and the reason the scheme will probably fail. Bikes have now been put in place. I suppose a railway station is an obvious place to put them, but there is a rack at Fed Square, another outside Young and Jacksons and one outside St Pauls. The helmet issue is a disincentive, but not enough to turn me off the scheme completely. If the scheme were otherwise sufficiently attractive, I’d buy a helmet and put up with having to carry it around. And if I hired a bike for that purpose, I couldn’t guarantee getting back within the 30 minute free hire period. Put a bike station at the other end of my trip, and it becomes a viable option; I’d just hire another bike for the return journey. So they’ll have to roll out many more bike stations in order to convince me to sign up. In answer to Funkineering and Alan: I don’t consider what you call “picking holes” and coming up with pragmatic solutions to be mutually exclusive. One must precede the other; if not, who would bother coming up with solutions to problems that don’t exist? To know what the problems are, someone has to articulate them. Call it picking holes if you like. I call it valid criticism. If no one bothers to articulate the problems, or does not want to, for fear of being accused of picking holes, then the scheme risks just dying quietly without anyone ever knowing why the public didn’t take to it. it’s awful enough being a melbournian trying to cycle through peak-hour traffic, i can’t imagine being a tourist trying to get through that crap! OzSoapbox: I don’t think trashing will be a problem – unless you wish to lose your $200 deposit. They need an exemption in the helmet law for people riding bike share bikes and only these bikes, however the user must not sue if they are involved in an incident where a helmet would have made a difference. @Philip, apparently with some cities’ bike share schemes you can lock the bike up when not at a station. Don’t know if these ones allow it. @Funkineering, Park And Ride is not to be encouraged. In many cases it takes people off PT and puts them into cars for 80-90% of their trip. Securing a helmet to an existing bag may or may not be to people’s liking. If you’re not carrying a bag at all, or carrying a small one, I can’t see people going for it. I can’t see what on the BV site refers to re-distribution, but apparently in some cities staff move the bikes around when they find an imbalance. @Alan, fine, have a go at those picking holes in it, but these questions should have been answered or addressed before the scheme was set up and the $5 million paid to make it happen. @m, don’t troll, of course you can’t. @enno, I didn’t even know it was called that. I assume it means near Bowen Crescent. @Bonnie, did you check the link Alan posted? It shows proposed stations. Yes, the danger here is that the government watches it fail, then uses it as justification not to invest in other, arguably more useful cycling infrastructure. @Peter, I think OzSoapbox is refering to people who haven’t hired bikes, vandalising them while they’re locked in the stations. Hopefully given the same type have been used overseas, they’ve anticipated this and they’re tough enough to withstand attack. Kind of amusing that they bought existing technology/designs for this, and got it running just over a year after it was announced. A stark contrast to Myki. Bonnie, fair points, and let me clarify. Problems by all means should be identified, but we should also try to offer solutions, rather than have a good old whinge and say flat out it won’t work. Coverage should definetly be improved. This system is about getting from point to point. Rather than riding contiously long distances. If most parking points are within 5 km’s of each other, you could conservatively ride from point to point in under 30 minutes, and drop off and start a new trip. All for free. I see this system as a tool to tackle peak hour public transport congestion. The trick is to place enough bikes and stops on congested public transport corridors and get some people riding instead adding to tram squeeze. Suggested corridors are the southern cross to docklands route and the flinders st to domain interchange route. Further the system can be used to connect public transport hubs to major tourist attractions, and key goverment service areas (hospitals, the passport office, courts). 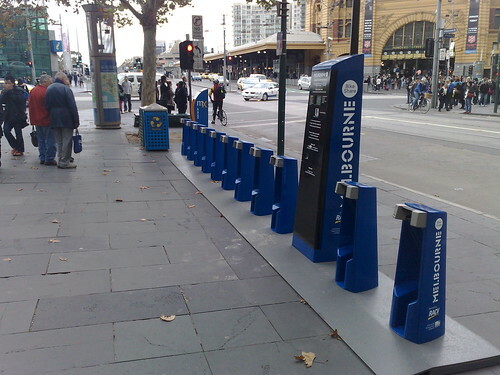 The organizers should obviously work in conjunction with yarra trams and metro trains, to co-ordinate bike share stops. I honestly don’t see the lack of helmets to be a big issue. It’s a merely a matter of getting used to the concept and integrating it into your lifestyle. Bike riding is not for everyone, but for those that don’t mind a bit of exercise, it’s a new option that was previously unavailable. Who do I think is the main target audience? International students, city workers, tourists, and importantly commuters working on the fringe who are sick of overcrowded public transport. I don’t see these people using this everyday. They might forget their helmet, they’re tired or it’s raining. It’s to complement the public transport system, and not replace it. One thing that hasn’t been discussed yet is discounts on days of bad weather. To maximise utilization and to reward diehards, I’d like to get this idea out there to be discussed. In the end, I think this is a worthwhile pursuit, and compared to buying more trams or trains could be a cost effective solution. It needs to evaluated 6months-1year down to track to check if the demand is sustainable. If its not, then let see where we went wrong, and take it from there. This is a very nice idea in concept but I agree with the shortcomings you (Daniel) mentioned. The helmets will be a major sticking point. People will not want to have to carry them around if they would only use the bikes occaisonally. They might be more inclined to want to carry one if they used the bikes daily or at least several times per week. I personally would not like to put shared helmet that had been left attached to a bike on my head that had been used by who knows how many people. This is about as attractive to me as drying off with a bath towel previously used by a stranger without washing or sharing a toothbrush. Just look at some of the creatures on Swanston St. who would be sharing with you. A machine next to the bike rack that could dispense freshly cleaned and sanitized shared helmets and also have a place to return used helmets would solve a major problem. The helmets would also have to be a “one size fits all” style of course. I would also imagne there will be a fair number of accidents with riders not being used to riding a bike and dealing with all of the cars, people, and horses in the CBD. A person who already owns their own bike will be a much more practiced and safer rider. Hang on, I thought the original publicity about this (months ago) said it was going to be a free bike scheme. Didn’t it say that? Or have I confused it with the schemes in cities where it has worked. @funkineering, thanks for all your thoughts. Obviously now it’s launched, we’ll have to see how it runs. @Jed, I wonder if a one-size-fits-all bike helmet exists? I suppose if it’s adjustable it might be feasible. @Philip, without checking, I don’t recall any claims it was going to be completely free. The first half-hour is free, but only if you’re already a subscriber. The whole helmet idea ruins the spontaneous nature of hiring the bikes to get around. Instead you will have to plan on using the bikes from the start of the day….if the tram happens to run late, you could just get on a bike a and go… but having to plan intentionally on using the bikes….i just can’t see that being integral to peoples way of life. Didn’t The Age mention that NO other country in the world that has compulsory helmets has bike share scheme? I cycle into the city three times a week… each is a 60km round trip. I would have preferred to see improved bike parking areas…. such as around the area of Melbourne Central. Bike riding still isn’t considered a serious form of everyday mobility by many in Melbourne…its improved over recent years, but Melbourne is NOT The Netherlands unfortunately. I’m sure the cultural difference is why places like the Netherlands don’t have compulsory helmets. Once again, Melbourne pretends to be something that its not. That is the key problem. If people did not have to plan for it, the system would be more effective. Ie, “I’d better take my helmet, I might want to rent a bike” vs “hmm, 15min to the next bus/tram/whatever… oh, look over there, a bike I could jump on right now”. Re: redistribution, in Paris the staff had to keep moving the bikes to the tops of hills, eg near the Pantheon. People were happy to roll down the hill, but not so keen to ride up. While I agree the compulsory helmets are an issue in this sort of scheme, there’s very strong reasons (ie it saves your life) why that law has been made. Just because Copenhagen doesn’t have helmet laws doesn’t mean they’re actually right to do so. I’d be interested to see their fatality or serious brain injury rate per cycled km compared to Melbourne’s, for instance. If you’ve already a backpack, it will probably fit a helmet. And let’s face it, you’re not likely to be riding these bikes in a business suit/dress, in lycra (commuter cyclist), or when you’re going out somewhere ‘special’. Which pretty much leaves tourists, students, and your average inner-city resident after work or on weekends, all of whom are reasonably likely to have some sort of carry bag which could stash a helmet (it’s just the bulk, given they weigh virtually nothing). I think this is a broad enough market to start with – and who they seem to be aiming it at anyway. Make it easier for the tourists by ensuring the street vendors/shops nearby have a good supply of S/M/L $20 helmets. It’s ironic that helmets are seen as one of the major sticking points, given that schemes like this are meant to reduce road traffic. Which is, I presume, why we have mandatory helmet laws in the first place? I happen to work at a place whose location enjoys all the congestive joys of inner suburbia, and all the remoteness of the fringe. While I often cycle to work, it is a long trip and I wimp out for the trains in wet weather. Faced with a twenty minute trudge from Flinders St (and before you ask… what trams?) 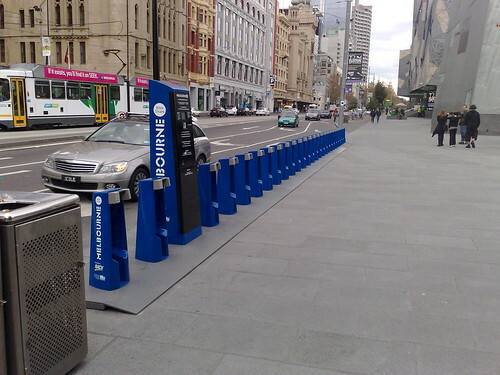 I would welcome a bike scheme like this… if they ever decide to place a station at South Wharf! For interest sake, here’s a report from someone who’s actually tried the system out. Thanks Arfon for the shoutout for my review of the bike share system. I won’t repeat all that’s been said about the unpracticality of having mandatory helmet laws combined with a bike share scheme. Absolutely agree, agree, agree! On another note, I think some quick-thinking entrepreneurs should get started with a helmet buying/hire stall/vending machine, situated right next to bike docks. Helmet laws are unlikely to change any time soon, so why not take advantage of a gap in the market? Thanks, Alan, for the link to the map of proposed stations. That definitely makes the scheme start to look more attractive. Funkineering mentioned international students. Good point; I’d forgotten about them. There are heaps of international students living in the College Square apartments (Lygon St) and in the northern part of Swanston St, very close to some of the existing or proposed bike stations. Unlike full-time local undergrads, international students are ineligible for concession fares on public transport. The bike share scheme, with its modest annual fee plus the cost of a helmet, begins to look like a very reasonable alternative to a PT full fare for someone on a very limited income. I think full-time local postgrad students are also ineligible for PT concession fares, although I am happy to be corrected on this. Melbourne Uni today mentioned this scheme in its regular newsletter to staff and students, and in it they identified another group I hadn’t thought of: those students who have classes at both the Parkville and Southbank (VCAM) campuses. 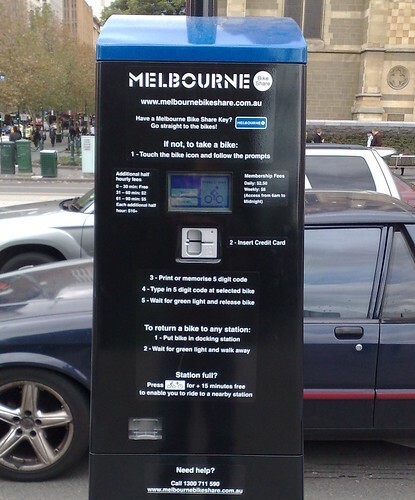 The bike stations at Melbourne Uni are located at Tin Alley (near the swimming pool) and at the Monash Road entrance in Swanston St, and there’s a proposed station right outside VCAM at Southbank. If they put another one over the other side of the campus, somewhere near the Conservatorium on Royal Parade, or near the Old Arts building, or near the Baillieu library (the logical places where you’d expect to find that cohort who have classes at both VCAM and Parkville), then I think it would be just as quick, if not quicker, for a student in that cohort to walk out of one class, jump on a bike outside the building, and whiz down Swanston St to their next class at VCAM, than it would to catch the tram. Daniel: well, yes, but there’s nothing special about full-time local postgrad students in that regard. As you say, it’s the health care card eligibility that matters, and you can only get that if you’re on a very low income, for whatever reason. My point is, full-time local *undergrad* students have always been eligible for concession fares, regardless of income or assets, in a way that postgrads never have been and still are not. Undergrads don’t need to have a health care card. They don’t need to provide any proof of low income. They could be the recipients of a large allowance, courtesy of wealthy parents. Or they could be earning a substantial full-time wage while they’re studying full-time (as I once was, briefly – mind you, the workload nearly killed me). Or they could be the partner of someone earning a normal full-time income. None of these things have any effect on their eligibility for concession fares. And I’ve always thought that this is inequitable. If full-time local undergrads are eligible solely by virtue of their enrolment status and nothing else, then full-time local postgrads should be too, in my opinion. They’re students too, and they’re not likely to be any more flush with funds than undergrads are. Mind you, if anything is ever done about this inequity, I suspect it will end up being in the other direction – i.e. that undergrads will become subject to the same income rules as postgrads, and will have to produce a health care card to be eligible for concession fares. So if you want to use the bike twice in one day, then how ? Insert the credit card the first time, for a $2.50 daily fee. Get the 5 digit number ( 1,2 and 3 only ), take the bike and ride to wherever, park the bike. Then later you want to go back where you started. How does that work then ? Pay the $2.50 again . Or use the same 5 digit number you got earlier (if you remember it). Or even insert the credit card for no additional charge and get a new 5 digit number ? If the same 5 digit number is good for multiple trips in a single day, here’s the catch. There are only 243 different 5 digit numbers with 1,2 and 3 in them. A thief can walk up to the machine and enter a 5 digit number composed of 1,2 and 3, at random. The odds are, someone already had that number on that day. He takes off with the machine. The person who was given that number previously on that day gets blamed. Your cynicism is spot on. I too would love to be proven wrong with this but it seems that virtually every aspect of this system has been very poorly thought out. I’ve done a rather in depth an analysis covering the planning, implementation and helmet laws at my blog. I’d love to hear your feedback. One other thing that I’d like to mention regarding the helmet laws because I’ve seen this mentioned multiple times here and on various other forums. Australian helmet laws not only state that riders must wear a helmet all the time but also that any rental helmet but be physically checked between being returned and given to another person to use. There are also no ‘fold up/inflatable/extra portable’ helmets that I am aware of that meet Australian safety standards. If anyone can correct me on that issue I’d appreciate it, I’ve looked but haven’t found any examples yet. I also don’t believe there is a ‘one size fits all’ helmet that meets safety standards for bike riding. So with the hire helmet system, it wouldn’t be feasible to put them at bike stations to be automatically dispensed, unless there was some kind of system that stopped returned helmets being dispensed until someone physically checked them, and even then you open up a whole other can of worms with the logistics. Say 5 helmets get used 20 times a day at each of the 50 stops (still well under the usage of lots of bikes in other share systems around the world) that’s 5,000 helmets that have to be checked each day in 50 different locations! What happens when nobody has a chance to check the helmets and no more can be dispensed, etc? And this is still ignoring the hygiene issue of sharing helmets. If you look at who uses these systems in cities where they have been highly successful (see Paris, Barcelona, Montreal) you’ll see that the system has been taken up by a very wide demographic. When I was visiting Barcelona every second person seemed to be riding on of their bikes, with the major exception of tourists simply because it did take a bit of stuffing around to get an access card (luckily I was able to borrow one from my brothers friend!). The other bonus of having the systems in place is not only that the over all riding had increased because people were using the systems, but that people that previously did not ride very often were discovering the joys of it and jumping on their own bikes more often too. Bicycle shops in Paris reported a jump in bike and accessory sales after the system was introduced.